Recently I got a report from a customer that their computer had been infected by a virus. The description of the problem was the computer was running slow, it can’t save any documents because the hard drive is nearly full although there aren’t that many files, and the Internet Explorer font is weird. The first thing that I always do before anything is run MSCONFIG (System Configuration Utility) and check the startup entries there. It’s not the best tool to check for every programs that starts up with Windows, but it’s a basic built in one which is able to give a rough idea if the computer is infected by virus or not and should be present on all versions of Windows. Windows cannot find ‘msconfig’. Make sure you typed the name correctly, and then try again. To search for a file, click the Start button, and then click Search. When you get this kind of error. it’s usually a virus that is the culprit for removing msconfig, regedit, task manager, the Command Prompt and and a few other system commands from being accessed via the Run box. If you have a similar problem and have already checked for and removed any malware, here are a couple of possible solutions to get the MsConfig program back working again. First of all, you need to make sure that the MSCONFIG program is still present on your drive. Surprisingly, the odd thing about MSConfig.exe is it’s not located in either of the 2 most obvious directories of C:\Windows or C:\Windows\System32 on Windows XP, which is where the other system utilities are found. That should restore MSConfig.exe to your Windows install. 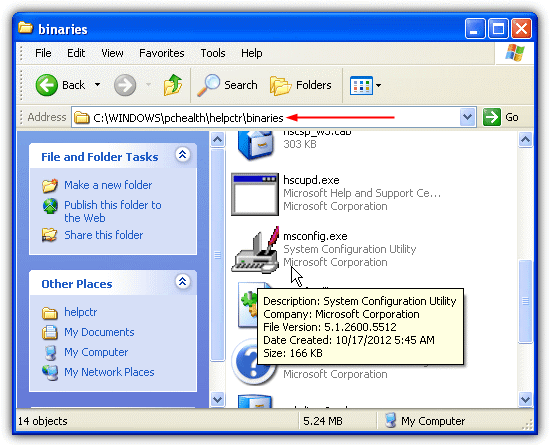 If you do not have access to another computer or the XP installation CD, you can download MSConfig.exe from below. If the the path is not correct, simply change it to what is shown above. If you are not familiar in editing the Windows registry, you can just download and run this registry fix file. Once you have both MSConfig.exe file in your computer and the registry path is set correctly, you shouldn’t have problems running msconfig command from Run. 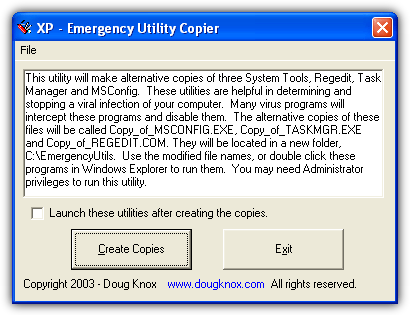 In addition to the fix above, there’s a very simple little tool called Emergency Utilities Copier that is able to create usable copies of REGEDIT, MSCONFIG and Task Manager from Doug Knox’s website. This small VB 6 utility will create a usable backup copy of Taskmgr.exe, MSConfig.exe and Regedit.EXE in a new folder, called C:\EmergencyUtils. The new copies will be named Copy_of_Taskmgr.exe, Copy_of_MSConfig.exe and Copy_of_Regedit.com. Because of the critical nature of these files in repairing and diagnosing system problems, they are usually a priority target for malware which will try to disable access to them, or remove the files completely. Having the files backed up in an alternate location either by this program or doing it yourself can prove quite useful because they can easily be copied back to their respective folders within seconds. If you can’t find it in the System32 folder, a search in the C:\Windows\WinSXS folder should provide a backup MSConfig.exe which you can copy back over to the System32 folder. If it’s not there either, you will either have to extract it from a Windows install DVD, or you can download the MSConfig.exe file for Windows Vista or 7 from the links below. If you want to get the file from your Windows install DVD, using an archiver such as 7-Zip, go to the Sources folder on the disc and open the Install.wim file. Inside are some numbered folders, simply go into any one of them and navigate to Windows\System32 and extract the MSConfig.exe to your System32 folder. If you have a recovery image or partition, there should also be a wim file which likely holds a copy of the file. As MSConfig.exe in Vista and 7 is already located in the default system path, there isn’t a possible bad entry for it in the registry like there is in XP. Unfortunately is was not only the appPath for msconfig.exe that was missing. The subkeys were all missing for the other programs found using them registry method (instead of the old way of using the PATH env vars). Twould be appreciated to have a .reg file provided that defined all the standard (install-time) subkeys (by app file) and their default item values (path to the app file). I had several windows system files quarantined and was not aware until I tried running MSCONFIG.. which was not found. to retrieve them, simply open your antivirus vault, and remove the appended .vir from the file. Return the file to system 32. Hey man, thanks for your straight forward no B.S. advice. wasn’t life or death, just frustrating. You the man Raymond. Followed your Registry Editor instructions – had to add the folder MSCONFIG.EXE – and then the default info. Everything worked great. Thanks for all the help.. Thank you very much! In my case,it was missing from system32 folder. Thanks you so much Raymond! I guess the virus corrupted only the shortcuts to important applications. My antivirus messes up with my firewall so I have to enable it again every startup, and a help desk suggested I use msconfig but won’t find it, not until now. Thank you so much! Well done. Thanks very much. thank you so much… I would say you are such a very generous person. Thank you so much, msconfig now working from command prompt. Regedit was a little different looking in my winxp, but I downloaded the fix patch and it worked like a charm, thanks again! It also helped me friend. Thanks a lot!!! it helped me a lot thanks, it was nice and very helpful to me as it solved my msconfig problem otherwise i was thinking for doing a format to my pc, thanks again. Raymond, thanks a lot! My msconfig is back thanks to you! it’s really worked. thanks a lot!! Just a quick ‘thanks’ for your article. I was fixing someone else’s virus-ridden XP machine and couldn’t get msconfig up. thanks very much . it resolves my problem. I couldn’t find a better and detailed solution than this. This was a ton of help. Thanks for this post, I really appreciate getting my MSConfig operating again! very detailed help, thanks a lot! This is a great article. It helped me a lot. Thank you. It’s usually a good idea to make sure the malware has been removed first. Some tend to replace msconfig.exe, taskman.exe etc. with trojaned copies and such. One such culprit would be the Sohanad virus aka coolpics. Restoring from the Windows CD as you’ve said is a better idea. Or you could check the Digital Signature on the files, make sure it’s Microsoft and not something like “IT University” :-). Sometimes it even disables the Start – Run prompt, but you can just use a .bat file, .Vb script or something to enable it again :-). Anyway, if there is any suspicion of such a virus, it’s good to submit it for analysis to virustotal.com (or try some simple steps with ProcMon and VirtualBox). One more thing: you could technically “replace” all (and more) of the functionality of MsConfig with Sysinternals Autoruns. It can also check digital signatures too. You can use it to disable malware at startup for example (Sohanad may even pose as msconfig as an autorun).